Khaled Al Sabawi is a Canadian entrepreneur of Palestinian origin. Khaled is the founder and President of MENA Geothermal, a Palestinian green energy start-up and two-time recipient of Energy Globe Award that grew to install the largest geothermal system in the Middle East at the American University of Madaba in Jordan. Khaled is also the CEO and Vice Chairman of Union Construction and Investment, one of the largest real-estate development companies in Palestine. At UCI, Khaled founded TABO, a development project that focuses on expanding property rights in the West Bank and allows Palestinians the ability to own affordable, registered plots of residential land. TABO is a response to the increasing cost of land in Palestine and also protects land against Israeli annexation through title deed registration. Khaled was named “One of the World’s Top Energy Entrepreneurs” by Global Post in 2010 and was ranked the 195th Most Influential Arab by Arabian Business Magazines. In 2013, Khaled received the Takreem Award for Young Entrepreneur. In October 2014, Khaled was featured on the cover of Forbes Middle East with “Industry of the Impossible” as the caption beside his name along with a feature article titled “The Good Deed” in English. In November 2014, Khaled received the prestigious Young Alumni Achievement Medal from the University of Waterloo’s Faculty of Engineering in Canada, one of the most renowned faculties of engineering in the world. In 2015 Khaled was selected as a Young Global Leader by the World Economic Forum. 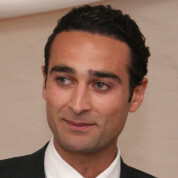 Khaled is a graduate of the University of Waterloo’s Computer Engineering Program and the Harvard John F. Kennedy School’s Global Leadership and Public Policy for the 21st Century Executive Education Program. "Teachers are the guardians of our past and the protectors of our future; they are essential to our everyday lives for no matter what changes we experience, one fact will remain; we will always be students."